I have more than 15 years of backpacking experience. Day hikes and 2-3 day backpacking trips take place on most weekends throughout the year while longer trips are only occasional. I backpack predominantly in mountain terrain (Coast Range, Cascades and Canadian Rockies) with the goal of summiting peaks. Activities I use my gear with include mountaineering, ski touring, rock climbing, kayaking, biking, trail running, Search and Rescue and overseas travel. I like my gear to be reasonably light, convenient and simple to use though I would not claim to be a lightweight hiker. The Ultra-Sil Nano Dry Sack is Sea to Summit's lightest dry bag. Its suggested use is in a backpack, super lightweight hiking, climbing and cycle touring. Ultra-Sil Nano refers to the 15 denier siliconised nylon fabric used to create this ultra-lightweight sack. It claims to have a 1200 mm waterhead. I believe this has something to do with its waterproof strength. It uses a Hypalon roll top closure, which apparently "does not wick moisture", I'm assuming that's a good thing. The sack stitching is reinforced and seam-sealed for maximum waterproofness. There were instructions sewn into the inside of each sack, which were to be removed after reading. They show a diagram of how to close the dry sack. The key was to fold down the roll top closure at least 3 times before clipping the buckle. Further instructions advised to avoid contact with sharp objects and abrasive surfaces. This made me think putting any hard climbing gear (cams, draws, nuts, etc.) in these bags is probably not a good idea. No worries, since I've got lots of other gear that needs packing. The manufacture also states sensitive electronic equipment should only be packed with the use of 2 dry bags. It was also clear that these bags should NOT ever be submerged. As for washing the bags, they should only be hand washed in warm water. 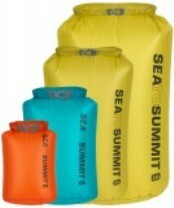 The Sea to Summit Ultra-Sil Nano Dry Sacks (8 and 13L) arrived in a super light package in the colors yellow and orange. It seems the 'green' listed on the website is actually 'yellow' in color, which is consistent with the website image. They were slightly heavier than the listed weight, but otherwise were exactly what I expected when previewing the website. They looked slick, were ultra-lightweight with minimal material, silky smooth and easy to open and close. The seams are well crafted double-sewn and seam-sealed. I will be looking to see how they hold together and whether or not any delamination occurs over time while using the items for backpacking, kayaking and climbing. I have blown up the bags and closed the bag as per instructions and they appear to be airtight, that is a good sign. I am very curious how waterproof the material is, which will determine what I put in them. At the moment I'm a little cautious about putting a down sleeping bag in it as I know I'm not supposed to submerge the bags in water, but how about hiking for hours in the rain? I shall be the one to let you know (unless this year is full of sunshine in the Canadian Rockies, not that I would complain). I've also got a sea kayaking trip, some white water kayaking and an adventure race with a kayaking segment planned for these bags as well. Stay tuned! The Sea to Summit Ultra-Sil Nano Dry Sacks so far seem like an ideal solution to lightweight packing. The bag's oval shape as opposed to round seems much more conducive to packing inside a backpack or kayak, possibly saving space. They look great and are easy to use. With some of the limitations in mind such as double bagging electronics and avoiding abrasive surfaces, I will be aiming to test their waterproofness so that I can confidently use them for anything I want to ensure is safe and dry. I give my sincere thank you to Sea to Summit and BackpackGearTest.org for allowing me to test this dry bag series. Over the past 4 months these dry bags have accompanied me on several multi-night backpacking trips in the South Canadian Rockies (Banff National Park, Glacier National Park, Bugaboo Provincial Park and Height of the Rockies Provincial Park). 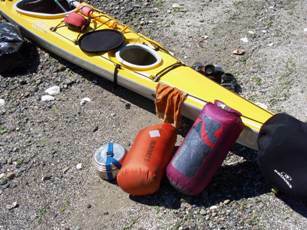 I have also brought them on a few car camping trips, day hikes and a 4-day sea-kayaking trip in the North Gulf Islands. They have also been a part of my Search and Rescue ready-pack to keep my down jacket and extra clothes dry. They have seen everything from mountain thunderstorms, to snow, to creeks, to salt water ocean. These dry bags have been absolutely fantastic to use. They are easy to pack and extremely light. They have proved to be waterproof in a number of different wet settings such as sitting in a creek, stashed in the snow, hanging from a tree in a downpour and sitting in an inch of sea water in my kayak. I trust these bags with my down sleeping bag and jacket. The 13 L sack I have used mainly for my down sleeping bag, it's a perfect fit. The only difficulty I had was in getting the sleeping bag out when it was suctioned in there. A pull tab at the bottom would definitely have helped, but only a minor nuisance. The 8 L bag housed my lunch and snacks for the most part, or a down jacket or vest or extra clothes, or just miscellaneous odds and ends. I found I had so many uses for them that I wished I had more. As a food cache, the roll down top and clip closure made a great handle that was convenient for hanging food to keep away the wild animals. 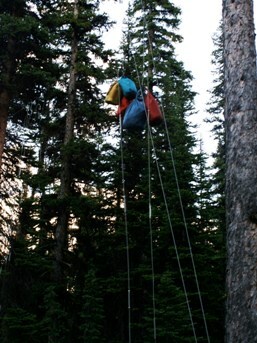 I had the fortunate opportunity to witness an awesome mountain thunderstorm that unleashed an amazing deluge of water onto these bags as they hung in a tree all night. In the morning I woke up to a dry beautiful day and with dry food! That earned my trust in their waterproofness 100%. 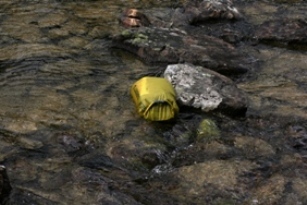 I even submerged these bags in a stream for fun and again everything stayed dry. I did take them sea-kayaking for four days even though I knew that was not their intended use. But they were dry bags and all, and I sort of ran out of marine dry bags, so I used them for some of the extra gear I had in the kayak. 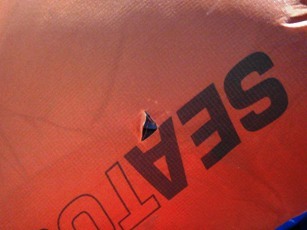 Unfortunately, one of the dry bags must have snagged something in the bottom of the boat, because when I pulled it out of the hatch it had a small tear in it. Fortunately, this compartment of the boat stayed dry even after a day of kayaking, and nothing got wet. Of course I had learned my lesson, but their performance was so encouraging that it seemed like a good idea at the time. I have since repaired the hole with some urethane water-sealing glue recommended by the manufacturer on the website and I was able to continue using it for backpacking - good as new! On the flip side, the one I used for quick-access stuff in the cockpit, sat in about an inch of water for 4 days of kayak touring, and everything stayed perfectly dry. In my initial report I was curious if the shape made any difference for packing as these sacks are oval versus the typical round. The only time I noticed this was for food storage, some of the items (packaged meals) did fit better in the oval space because of their width and could sit flatter. 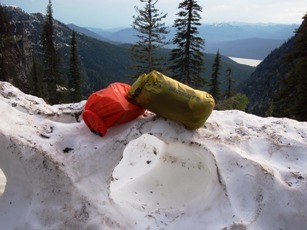 These dry bags have proved fantastic for backpacking. They are lightweight and easy to pack. They are great for storing and hanging food, stuffing clothes, down sleeping bags and jackets and I have full confidence in their ability to keep all these items dry if left outside in the rain, a stream or the snow. I will definitely keep using them for backpacking and actually will need to get more as I don't have enough for everything I'd like to use them for. 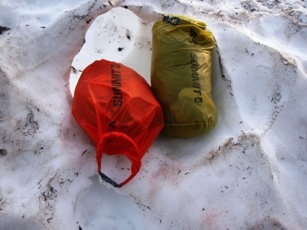 I give my sincere thanks to Sea to Summit and BackpackGearTest.org for allowing me to test these awesome dry bags!